The 2014 has been a wonderful year, because I had the pleasure of meeting you friends and share all my fashion tips with love!!! This new year 2015, The Trend Oven will confection new exquisite fashion trends for you to know how to rock style!!! Let’s make it count with the first post of the year, wearing a HIP HOP STORE outfit. For the after parties or just for the season, the sets are very trendy. Today I’m wearing a basic crop top in color white with details in gold. The black skirt is the sexiest part of the set, showing a cleavage at the side. To make a statement, I put on the shoes of desire from Novus in color red. 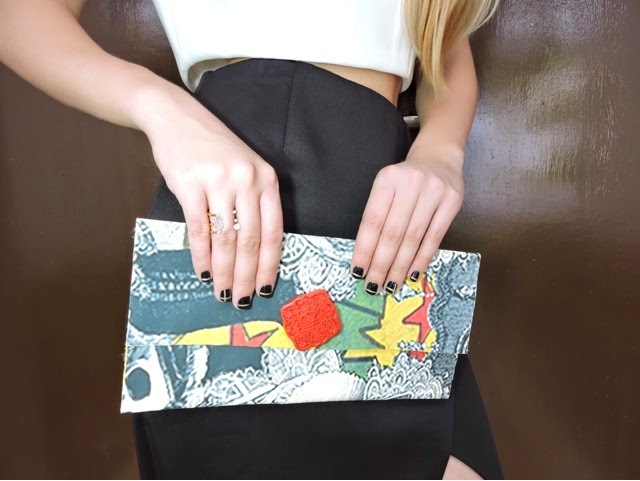 I also combined the with an artsy clutch from Arsty Designs By Luly. Hope you all loved the look and had an amazing time with you loved ones!! !